The Festival of the Holy Ghost is the most important in the island. A centuries-old tradition, it is closely connected with the religious feelings of the people of Flores. Enacting the rituals of the coronation of the "emperor", the showing of his insignia and celebration of the "bodo" or feast, attracts the inhabitants of the village and visitors. Similar festivals are held in every parish. The most important, lasting for two days, is at Santa Cruz, in which the town is decorated with flowers and coloured arches and there is dancing in the streets. 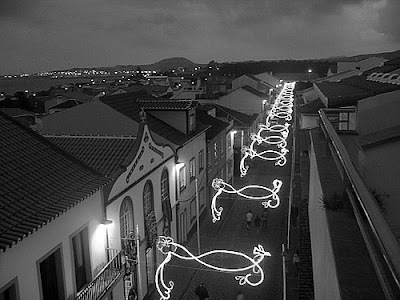 With the presence of the crowns of the 27 emperors existing on the island, it is considered to be the most important festival of the Holy Ghost in the Azores. The Holy Ghost festivals take place on Sundays after Whitsun until the summer. At Santa Cruz it is held on the last Sunday in August. Other festivals include the Folares (Easter cakes. including baked eggs), the processions of the Senhor dos Passos (Our Lord bearing His Cress), held on Good Friday in every parish. St. John s Festivals at Santa Cruz which attract many visitors, the Festival of Senhora das Flores held in honour of Our Lady at the Chapel called Capela dos Matos and the best frequented in the whole island, and the Emigrants Festival at Lajes das Flores on the 2nd week-end of July.